SHELLBROOK, Sask. – With the installation of a new and bigger culvert, motorists can once again travel on Highway 3, west of Shellbrook, Sask. As the spring melt arrived in the province, the original culvert failed under Highway 3 near the hamlet of Mont Nebo, Sask. RCMP say the sinkhole was reported by someone who realized a large hole had formed across the entire highway. The road was closed after a culvert washout left it impassable in late April. At one point, nearly 90 per cent of the roadway was a sink hole. The Saskatchewan Ministry of Highways and Infrastructure says it made every effort to speed up repairs and the installation was completed a week earlier than initially planned. The ministry announced traffic was flowing again on Thursday but reminds drivers to always slow down to 60 km/hr in highway construction zones. Shellbrook is approximately 125 kilometres north of Saskatoon. 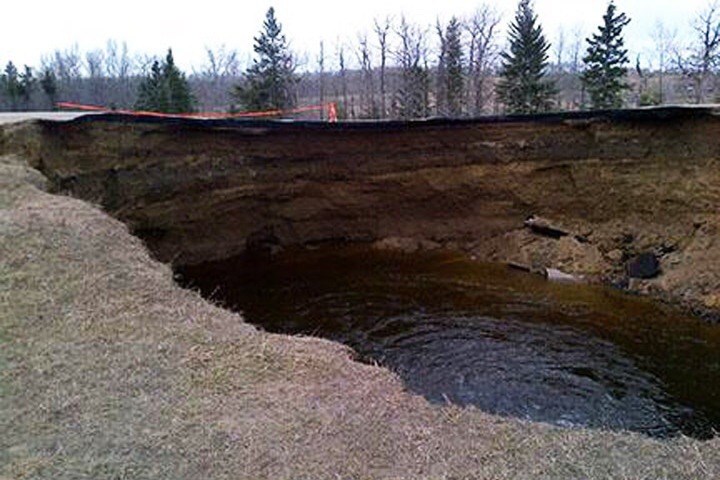 This entry was posted in Pictures, Top Ten Sinkholes and tagged Canada, sinkhole. Bookmark the permalink.